Chinking the inside of the cabin and building the fireplace hearth. In between the logs there is actually some insulation. It is encased between metal lathe and the chinking compound on both sides. Inside and outside. I do not have pics of us working on the chinking inside, but you can see how we did it on the outside HERE. It was the same process inside, except we stuffed insulation in between the logs before we nailed the metal lathe up. Next we covered the tar paper with metal lathe. before we actually set them in place with cement. which should help the stones adhere to it easier. We were completely finished installing all of the stones in place except one last red stone that my husband had held aside for the top center. He installed that last red stone and we took a step back to admire our work. We were quite pleased with the results. ....it happened, that last red stone fell. It broke quite a few stones on the bottom hearth and destroyed my perfect pattern. After I quit crying, we removed the broken stones and began to try to fill in the spaces with other stones. We finished it, but it will never be quite right, in my opinion. the excess cement was gently brushed off of the stones and this project was left to dry. We thoroughly enjoy the fireplace, despite the stone mishap. We'll be cuddling up by it tonight, probably watching a Christmas movie! Is it too soon for Christmas movies? Shhh, I had Christmas music on last night while cooking. You may have had a stone mishap, but the finished product is really nice. 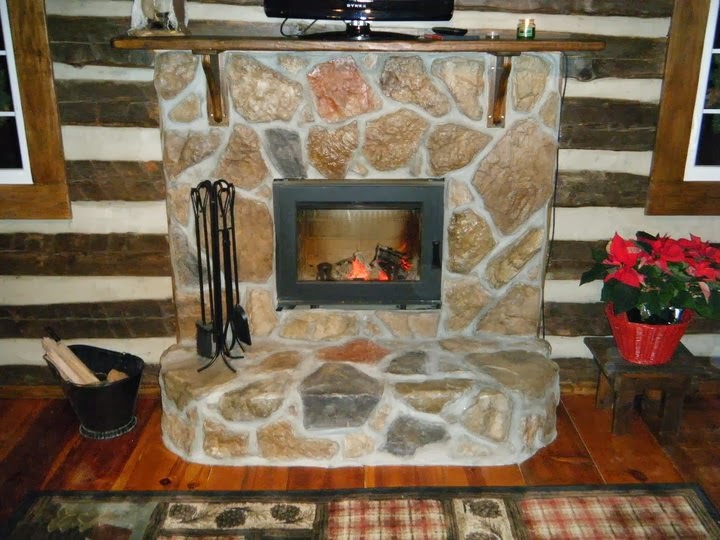 Did you find the stones for the fireplace on your property? Thank you and no these stones are actually manufactured to look like field stones but are not as heavy as the real ones. Although we have dug up enough stones around here that we could have used them. They have all been put to good use though around the base of some of our outbuildings and a rock ledge that we built to dress up a slope in our property. Thanks Linda! I'll be posting more on the inside soon. There are lots of little projects/furniture we've made for the cabin. Thanks Angie, I'm off to check out your blog!